Fall has come upon us but I've been hanging on to our walks to day care and our walks home. Some mornings we've needed the aid of a blanket while they eat their waffles. It gives them time to ease into their day care dropoff and it gives me one of the only opportunities I get to accomplish anything even resembling physical fitness. Jen finished up her old job. Here she is on one of her last nights, getting home about five minutes before the boys had to go to sleep when it is already pitch black outside. She has gone from a job which required her to commute four hours a day to one that requires her to commute zero hours a day. The result this week has been being able to spend more than 30 minutes a day with the boys, most of which was spent forcibly waking and dressing them in the morning then dropping them off at day care as they screamed and cried so that she could catch her train. We've also been able to have dinner together almost every night with the boys, something that we only ever enjoyed maybe once a week previously. Additionally I don't have to rush home from work, pick them up, and get them fed and rush them upstairs to get ready for bed, again while they kicked and cried. So, overall, life has become infinitely more enjoyable for Jen, me, and especially for the boys. It is the dawn of a new day. 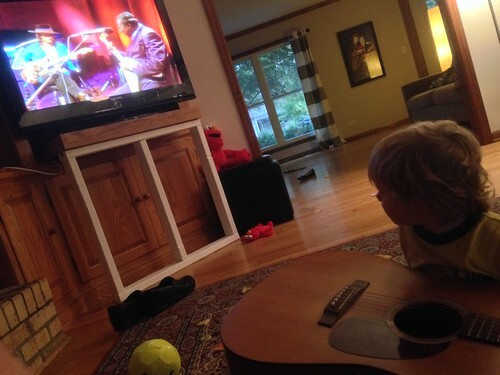 Martin has become obsessed with "the big guitar" which he likes to strum while he watches blues on the TV. Here he is studying Albert King's technique. This is why we will need to get small guitars for them soon since he is not exactly gentle with "the big guitar." They also like to continually hone their harmonica skills. They helped me in making the first stuffed pumpkin of the year mostly by fighting over who got to do the majority of the scooping. 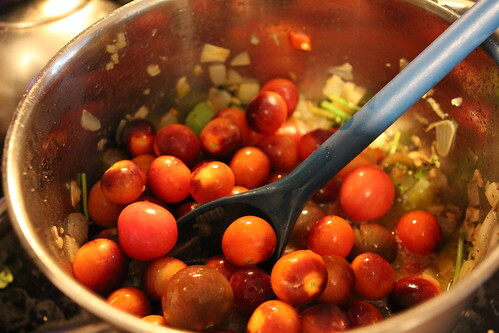 We used up the remainder of our tomatoes were finally used up in many dishes including this homemade ketchup which we now need to work on finding a use for. 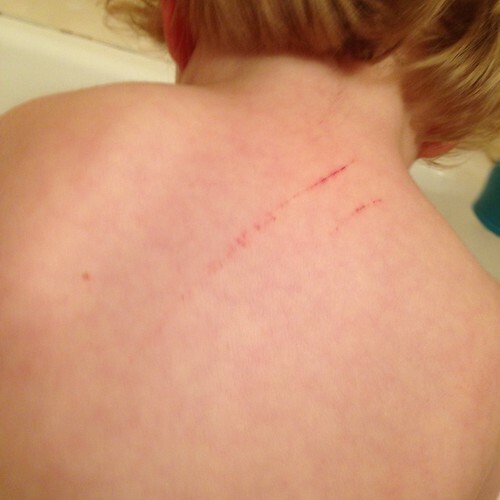 Martin came home from day care with some nasty scratches on his back. When I asked who did it he said, "Daddy." I asked again and he gave me the name of his teacher. I asked Elliott and he said it was one of the girls in their class. I asked Martin if it was the girl who scratched him. He said no. I asked again and he said, "Mark Knoplop." By which he means Mark Knopfler. It all makes so much more sense now. We went on our first pumpkin picking adventure of the year only to have this be the best out of the six hundred pictures we attempted to get of the three kids together. As with our apple picking adventure, the kids mostly only wanted to go in the bouncy house. Back home our pumpkin continues to grow despite Elliott's best attempts to stomp all over it and tear apart the leaves and vine. Martin is a little more tender with it. Despite being home a bit late I was able to get the boys to help me with a little Halloween decorating outside the house. This mostly consisted of them tryin to steal the cat and tear the hay bales apart. 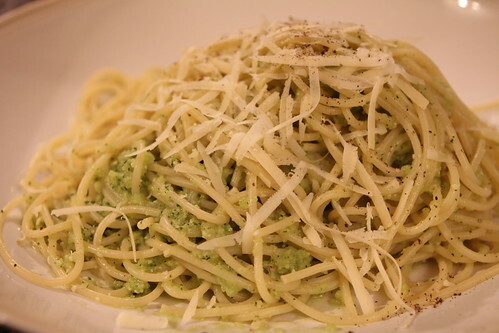 With the remaining green tomatoes from the vines I was able to make this spaghetti con pomodoro verdi which was shockingly easy to make and quite tasty. Canadian Thanksgiving rolled around and, after having to skip last year, we were able to host it for the first time at the new place. 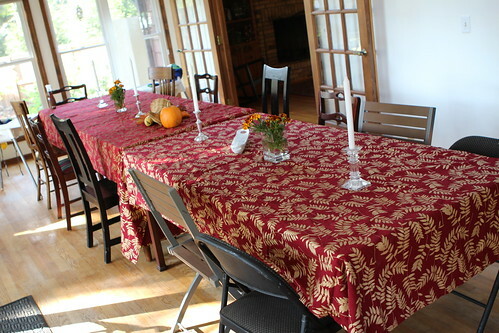 It's a bit of a novelty being able to offer everyone a table to sit on rather than the Thanksgivings of the past where most people had to sit on the floor. Out of all the chairs, we only had three or four that matched, the rest were a weird assortment of whatever we could find lying around the house. In the coming years hopefully we'll be able to step our chair game up. 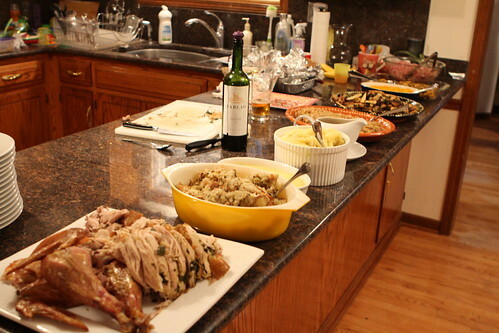 It also helped to have a long banquet setup on the counter. 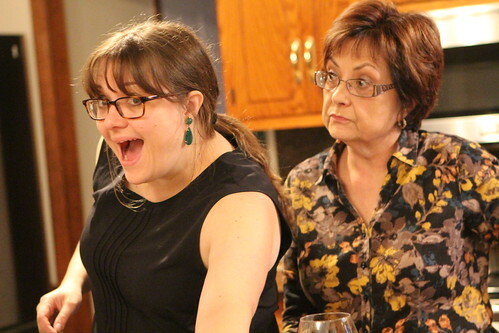 And it also helped that Jen's mother made this face at her. The boys enjoyed going outside to play this weird game where they leaned into a giant ceramic pot and yelled something indecipherable that sounds like, "Daya Doo Doo Doo!" And we've been able to play in the leaves which has been great fun. 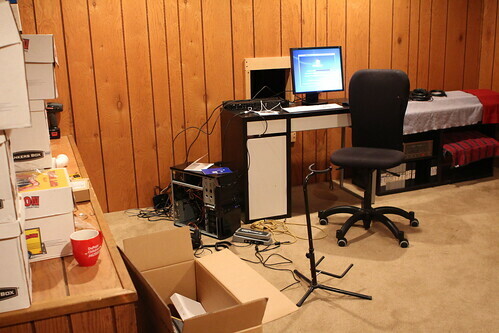 I have even squeaked out a few hours a week to work on my insane home studio project where I have this crazy notion that if I have enough time to actually build a recording studio in our basement that I will somehow have enough time to actually use it when I'm done. We decided to watch It's the Great Pumpkin, Charlie Brown with the boys for the first time the other night when they began identifying all the characters. "That's snoopy!" 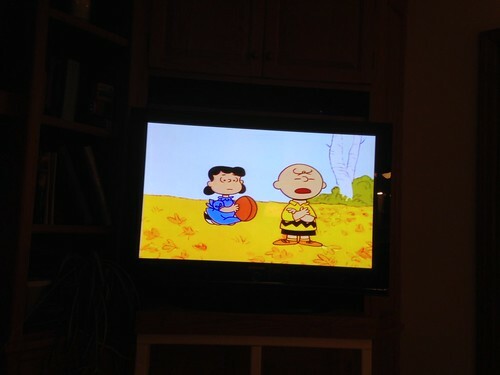 "That's Charlie Brown!" "That's Lucy!" We've never showed them anything with the Peanuts before. We may have watched the Christmas special last year but there's no way they'd remember it. I'm afraid to ask day care if they read books about the Peanuts because if the answer is no it will be even more alarming than it already is.